Huawei HSUPA Modem E176 - Tri-Band Cellular Modem easy-to-use USB modem HSDPA / UMTS -850/1900/2100MHz. The Huawei E176 3.5G Cellular Modem is a easy-to-use USB modem. Among Huawei's latest offerings is the E176. It builds on last year's E170, upping the radio specification and adding a memory card slot. 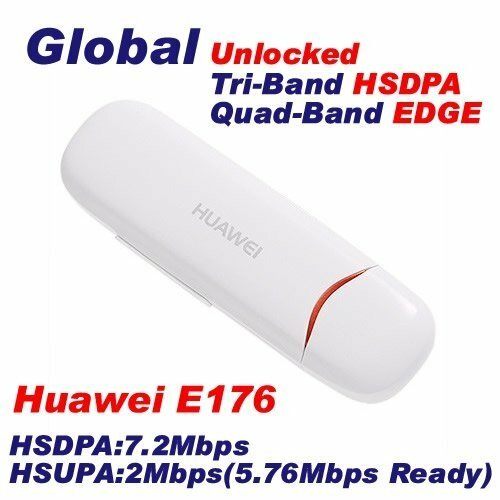 Like the Huawei E170, the E176 offers quad-band (850, 900, 1800 and 1900MHz) GSM/GPRS/Edge connectivity, but where the older unit could connect to HSDPA and HSUPA 3G networks on the 2100MHz band, the E176 adds support for the 850MHz and 1900MHz bands for better round-the-world coverage. Network Bands HSDPA / UMTS -850/1900/2100MHz. Dimensions Size: 85 x 27 x 12mm.. Supported Systems Windows 2000, XP, Vista, 7, Mac. Package Contents USB Modem in Box. Shipping* Most of our deals are promoted with free shipping (selected countries) byChina post air mail,Under 2KG usually send by China post, more than 2KG by EMS/DHL.Please contact us before you place your order if you need the goods urgently or your region is not available by China post. *The items are well-packed with bubbled packages and normally ready to be shipped to you within 3-7 days after your completed and cleared payment. *We support shipping via China post/HK post/UPS/DHL/FEDEX/EMS,please allow 5-20 days to reach. DHL usually it will be take 7-14 working days to arrive. *In order to ensure you receive your order with tax free or lower tax upon import,we`ll declare it as a“gift”with a lower value,if any import charges or fees are the buyer's responsibility. NOTE: Items which including batteries, CD or Gel cannot ship by DHL. For shipments sent to areas not covered by DHL regular service, Remote Area Service Charge applies, if your shipping address belong Remote Area, We will contact you directly for the payment required. 4. The trade is cross-border and Airmail is cheapest post way, so it'll take a long time for delivery. If you don't want to wait so long time, please pay the Express fee or don't buy it. 5. We will keep our item is cheaper, So all item price and shipping fee have no discount. 6. We don't Responsible for your Customs duty. 1. All the products we are selling include factory warranty, don’t cover items that have been abused, burned and damaged in any form. 2. Please contact us via email if you have NOT received item in 35 days, we will check it with post office, and then resend or refund any missing item. if you chose egular air mail without tracking no., please contact us after 40 days if you don't receive the item. 3. If you have a defective item, you want to return or discount. Please contact us within 2 days from you receive the shipment. All return items must be returned with it's original packaging and accessories. we will refund the money to you when we get the return items, Or replace item for you. Please contact me before you return it, or we don't responsible for return shipping fees. 4. If item defective in 3 month, We will send you a replacement without extra charger, or offer refund after we receive the defective item. If item defective after 3 month, you can still send it back to us. We will send you a new one after receiving the defective item. But you have to pay the extra shipping fee. We will deal with the refund in 2 business days when we get the info from you.